For the month of June, you can get the 20th Century Synth Box Vol. 1 and/or the Analog Model Machine for 30% off. Only available in the PreSonus Shop. Click here to purchase 20th Century Synth Box! Supercharge your Mai Tai sound library with this preset collection! Covering a wide range of styles from vintage to modern, Analog Model Machine is the perfect complement to Mai Tai’s factory sound library: a must-have for every Studio One user and analog synth lover! 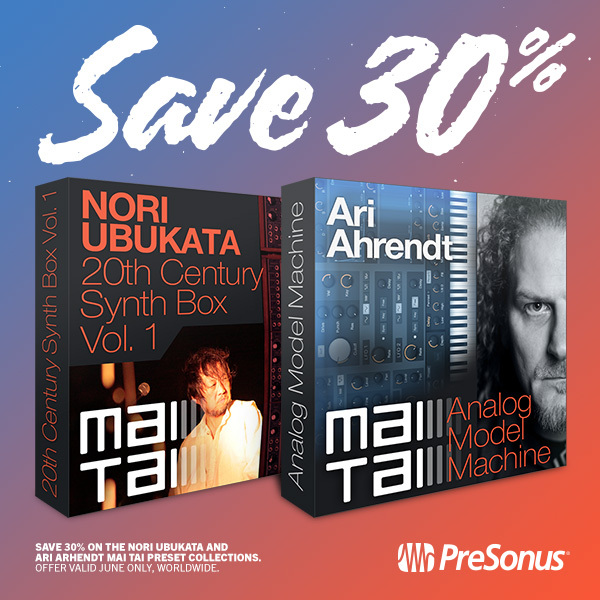 Created by Ari Ahrendt (Denoisary), Quality Assurance Specialist at PreSonus Software and member of the original Mai Tai design team, this set of sounds spans three decades of electronic music. Inspired by artists such as Vangelis, Jean Michel Jarre, Kraftwerk and Alan Parsons, these sounds perfectly capture the sonic characteristics of legendary instruments such as Minimoog, Buchla, TB-303, Solina, DX, Alpha Juno and many others. Click here to purchase Analog Model Machine!